Last month was my first time participating in the Secret Recipe Club. I had a great time going through the recipes on the blog I was assigned to choose one so I knew I definitely wanted to participate again. This month, I the blog I was assigned is Eggs, Cream and Honey. 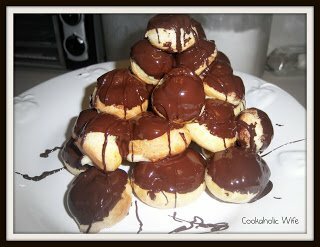 Heather has a ton of baked goodies on her blog and I thought it would be difficult to choose one until I found her post for a croquembouche. The first time I ever heard of/saw a croquembouche was during a Food Network Challenge. I immediately thought it would be an excellent challenge to try to make one myself and here was the perfect opportunity. French dessert consisting of stacked pastry balls into a cone shape. Typically served at weddings, this impressive dessert is usually held together by spun sugar or threads of caramel. This version is styled as a stack of mini eclairs. 1. Combine 3/4 cup of milk with sugar in a saucepan over medium-high heat. 2. Combine the remaining milk and the cornstarch together in a small bowl. Whisk in the whole egg and then both of the egg yolks. 3. Bring the milk and sugar mixture to a boil and then remove from the heat. Pour about 1/3 of the milk mixture into the egg/cornstarch mixture, whisking constantly so the eggs do not begin to cook. 4. Bring the remaining milk mixture back to a low boil and pour in the egg mixture while stirring constantly so the eggs do not cook. The cream will thicken. Remove from the heat and add the butter and vanilla. Whisk until completely incorporated. 5. Transfer the cream into a stainless steel bowl, cover with plastic wrap and chill immediately. 1. Line two baking sheets with parchment paper and preheat the oven to 425. 2. Combine the butter, sugar, salt and water in a small saucepan over medium heat. Bring to a boil, then remove from the heat and sift the flour into the saucepan, stirring until combined. 4. Transfer to a bowl and let cool for 1 minute. 5. Add 1 egg to the bowl and stir until the mixture goes from wet and shiny to dry and resembling mashed potatoes again. Add the next egg and repeat until you have incorporated 4 eggs. 6. In a small bowl, whisk the remaining egg with a pinch of salt. 7. Spoon the batter into a pastry bag fitted with a large tip. Pipe the batter in a circle, about 1 inch high and 1 inch wide. Each one should be about 1 inch apart. 8. Dip your fingers into water and round off any of the choux that has a tip from the piping. Brush the choux with the egg wash.
9. Bake the choux for about 10 minutes or until they have puffed up and are lightly golden brown. Lower the temperature to 350 and continue to bake for an additional 20 minutes. The choux will be dry. Transfer to a baking rack and let cool. 10. Remove the pastry cream from the fridge and spoon into a pastry bag fitted with a small tip. Once the choux have cooled, poke small holes into the bottom of them (I used a straw). Fill the inside of the choux with the pastry cream. 1. Dip the tops of the choux into the melted chocolate and place onto a cake stand or plate. Make a circle with the chocolate dipped choux and then begin the next layer, placing the choux on top of each other so they can stand alone. Continue building upward in a circular fashion until you have used all of the choux. 2. decorate with remaining chocolate, sugar flowers, spun sugar, etc. These are really tasty! They taste like little chocolate eclairs and honestly, this isn’t as hard to make as it appears. The only difficulty I had is that my choux weren’t the same size so it was hard to get them to stack on top of each other. I definitely plan on making these again, probably for some holiday get together that we’ll have here because I definitely don’t want to try transporting this!